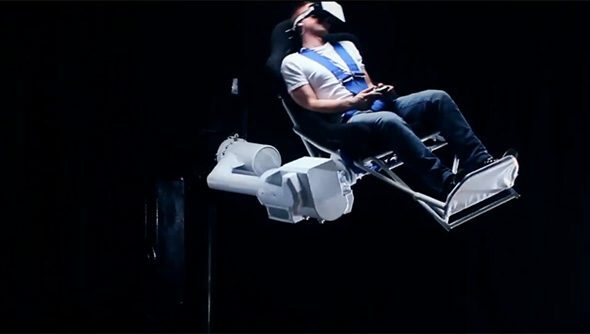 MMOne is a virtual reality gaming chair that rotates along three axes, spinning and twirling the player through the air like some sort of hellish fairground ride. At least that’s what it claims to be. Whether or not it actually exists is a different matter. Either way, there’s an incredible video. You have to watch it now. I’ve transcribed it below, in case you think you misheard something. The company’s website offers no way to purchase the chair, but simply lists a number of exciting uses, such as “check yourself as a test pilot, stunt the professional aerobatics tricks”.